A white-tailed buck forages during winter in the timeless eastern woodlands. Photo courtesy Annika Thierfeld. Editor’s Note: Author L.W. Oakley here considers the thoughts of a buck in the wilds of eastern North America as the hunt and winter ensue. Another long winter lay just ahead. Daylight was now longer coming and sooner leaving. The warmth of the sun did not soothe his body or calm his mind, even though the cold of the night kept him restless, on the move, wandering constantly. During the day, his mind carried him where his legs could not, into his past — to his hurried birth and abandonment, his constant struggle to survive and to search for food and danger, his great battles with other bucks, his rise to the top, his time as the main deer, his uncontrollable urge to mate, his inevitable defeat and exile, to his solitude at the dangerous edges and dark places in the timeless wood. L.W. Oakley studies a dropped antler. Each winter seemed harder, because he had already survived seven. Winter meant that he would go hungry, for there would be little and, often, nothing to eat. The coyotes would come, because they would be hungry and cold, too. They would test him again. If he was weak, they would know. He knew spring would eventually arrive as it always did. But he also knew he would not see another spring. 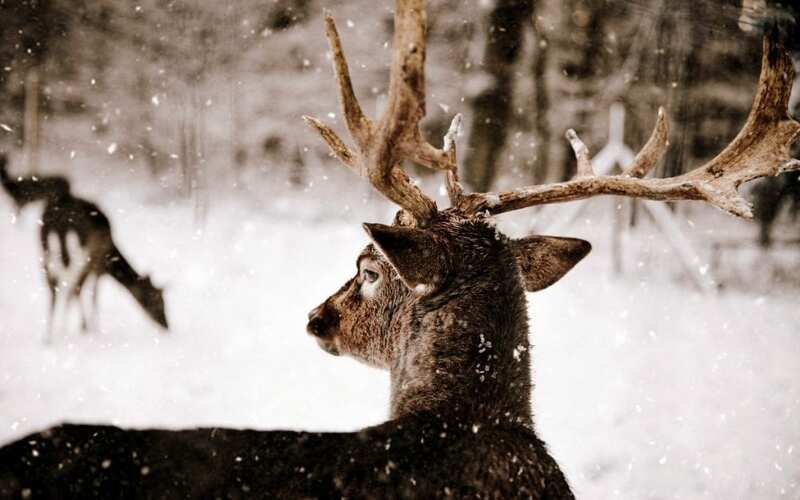 His body and antlers were still big, but he was old and grey. His legs were stiff and tired, and blood ran slow in his veins. He knew there was no escape from the unforgiving woods where he was born and where he lived out his secret life alone. Even before winter came there would be something more terrible to endure: the hunters were coming. They would return to the wet, grey November woods and bring their guns and dogs. He would hide in the day where the sun did not shine and move at night by the moon and stars. He let the other deer walk ahead. He was always careful when hunted and afraid. He knew the hunters were there to kill him. It wasn’t a game. Like all predators, they killed with their hunger. They were not fast and had no long claws or sharp teeth. They killed some other way, without touching, from a distance. He had seen the hunters kill other deer, leaving only a gut-pile behind on the stained ground. They were dragged away. He had followed the blood trail through the quiet woods. He had seen dead deer hanging by their legs from the trees, blood dripping, stretched out and head down. But now he was no longer afraid. He would let the hunters kill him. He hoped his death would come quickly — not the way winter took life. Winter delivered death slowly. Winter might even let him live long enough for the coyotes to find him and provide mercy, which is something they know nothing about. He heard a hunter walk through the big woods that last morning. He saw him climb into a tree as the red dawn rose from behind the tree-line across the swamp. As the big buck walked out carefully into an open space, he wondered if he would feel pain when he died. He remembered how it felt when a coyote tore away a piece of his right ear in his third year. He thought about how he drove his antler-tine into its eye socket and through its brain to the back of its skull. He could still hear the terrible final sound the coyote made. That was the sound of pain. He crumpled and fell silently to the ground when the bullet passed through him. There was a sharp pain, like a bee sting. The bullet cut an artery and broke his back. He felt warm inside, then suddenly cold. He was dead moments after that, but there was time enough to remember how it felt to be alive. Before that last deep breath passed through his nostrils, down his throat, into his lungs, then slowly back out, he could smell the cedar swamp behind him, could see the open sky above him, could hear the wind passing through the pines around him even as it caressed the cheek of the hunter who had just killed him with a single shot. The hunter wasn’t even a man — just a boy, really, until he fired the shot. He wasn’t even a hunter until he pulled the trigger and killed the deer, his first deer but not his last. The boy would forever remember that morning and return to that place in his mind until he also disappeared, like the buck that came before him in the sacred wood as old as time itself. 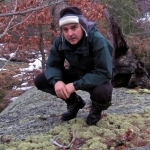 Born and raised in Toronto, Ontario, author L.W. 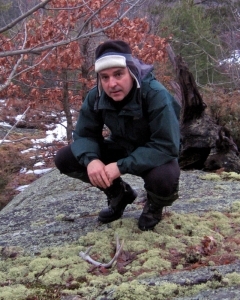 Oakley may best be known for his hunting books "Inside The Wild" and "Inside The Wild 2," published by Burnstown Publishing. He was graduated from Riverdale Collegiate and Ryerson University, Toronto. He lives with his wife in Kingston, Ontario.